Set in the 16th century, this is the story of Lapu Lapu, the first Filipino hero, in his battle against Spanish colonizers. As the ruler of Mactan and head of confederation of seven villages, Lapu Lapu (Lito Lapid) has always been just. He follows the tribal traditions and consults the elders for his decisions, even in his choice of marrying Bulakna (Joyce Jimenez), for his wife. But Raha Humabon and Datu Zula, leaders from other villages despise him and they want to conquer the village of Mactan, launching several attacks but always failing. On March 16, 1521 Magellan’s expedition landed on Homonhon island where Raha Humabon governs. 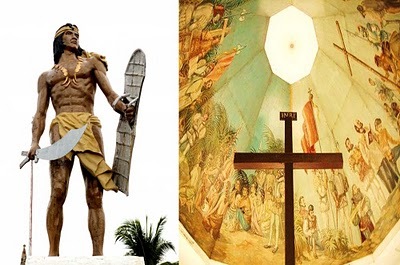 Magellan was the first European to reach the islands and Raha Humabon of Cebu was friendly with Magellan and embraced Christianity but their enemy, Lapu-Lapu was not. 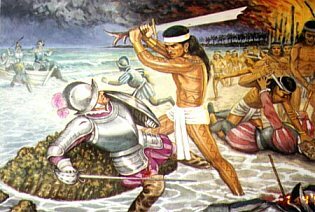 Humabon wanted Magellan to kill Lapu-Lapu while Magellan wanted to convert Lapu-Lapu into Christianity. On April 17,1521, Magellan sailed to Mactan ensuing battle killed Magellan by the natives lead by Lapu-Lapu. Out of the five ships and more than 300 men who left on the Magellan expedition in 1519, only one ship (the Victoria) and 18 men returned to Seville, Spain on September 6, 1522. Nevertheless, the said expedition was considered historic because it marked the first circumnavigation of the globe. It was 43 years before the Spanish returned, under Legaspi, to make another attempt to colonize the archipelago. This time they were more successful and stayed 350 years. The Spanish quickly organized their own colony according to their model. The earliest political system used during the conquista period was the encomienda system, which resembled the feudal system. b. Municipal government – (pueblos)- governed by the gobernadorcillo (petty governor) usually called Capitan, and his wife capitana. d. Cities – large town’s ex. Manila, Lipa, Jaro, Cebu, Albay, Aevalo, Naga, and Vigan called ayunatamiento. Rizal started writing the Noli Me Tangre in 1884, while he was studying in Europe. He completed one half of the novel in Madrid. One-fourth of the novel was written when he was at Paris, while the remaining one-fourth was completed in Berlin, Germany on Feb. 21.1887. The novel came off thepres on March 21.1887, with the financial support of Maximo Viola. Noli Me Tangre was dedicated by Rizal to hid motherland. The novel Noli Me Tangre is focused toward the seeking of reforms in our country during the Spanish Regime. Rizal advocated peaceful reforms in the Noli Me Tangre through Crisostomo Ibarra. September 18, 1891- José Rizal, the most celebrated intellectual and essential illustrado of the era, wrote the novels Noli Me Tangere and El Filibusterismo, which greatly inspired the movement for independence. Both portrayed the struggling life of the Filipinos under the Spanish rule. In 1892, Jose Rizal returned to the Philippines and proposed the establishment of a civic organization called “La Liga Filipina.” On July 3, 1892, the following were elected as its officers: Ambrosio Salvador, president: Agustin dela Rosa, fiscal; Bonifacio Arevalo, treasurer; and Deodato Arellano, secretary. Rizal functioned as its adviser. La Liga Filipina had no intention of rising up in arms against the government; but the Spanish officials still felt threatened. On July 6, 1892 only three days after La Liga Filipina’s establishment, Jose Rizal was secretly arrested. The next day, Governor General Eulogio Despujol ordered Rizal’s deportation to Dapitan, a small, secluded town in Zamboanga. La Liga Filipina’s membership was active in the beginning; but later, they began to drift apart. The rich members wanted to continue supporting the Propaganda Movement; but the others seemed to have lost all hope that reforms could still be granted. Andres Bonifacio was one of those who believed that the only way to achieve meaningful change was through a bloody revolution.